Between August 2003 and March 2004, the colour printer manufacturers, OKI Printing Solutions sponsored stringent research to test the Wright Theory (from which the Colour Affects System was developed). The project was carried out by the renowned Colour & Imaging Institute, at the University of Derby, across six cultures, in five countries throughout Europe - Britain, France, Germany, Spain and Sweden; Native Chinese observers resident in Britain were also tested. Observers were of both genders and all ages between 18 and 77. A total of 47 females and 72 males participated in Experiment 1; 48 females and 71 males in Experiment 2. The observers were native speakers of the 6 cultures: British, Chinese, French, German, Spanish, and Swedish. All observers were asked to perform the experiment twice, and thus the number of observations was twice the number of observers. The experiments were conducted on CRT monitors and each monitor was calibrated with a colour sensor; the calibration software was developed by the Colour & Imaging Institute. All the observers were tested for colour blindness. The objective of the experiment was to investigate the connection between adjective combinations and colour combinations. 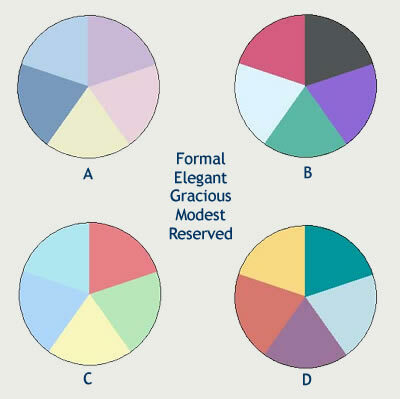 Four groups of adjectives and 4 groups of colours were selected in accordance with the Wright theory. Each time, observers were shown four groups of colours and one group of adjectives (emotional/human characteristics) and asked to choose which group of colours best captured the group of adjectives. The objective of this experiment was to examine the Wright theory on colour harmony, in 6 cultures: Chinese, British, French, German, Spanish, and Swedish. The Wright theory suggests that there are 4 categories of colours and the colours of the same category create universal colour harmony. The 4 colour groups used in Experiment 1 were also used in the second experiment. Two colour wheels were presented simultaneously on the screen. One of the 2 colour wheels was made by colours of the same colour group, while the other colour wheel was made by colours all but one from the same colour group. The Wright theory suggests that the former is more harmonious than the latter. 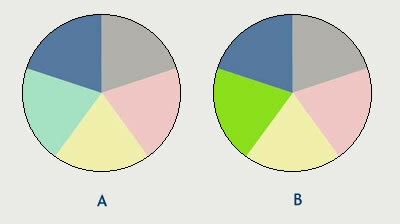 Observers were asked to pick one colour wheel that appeared to harmonise better than the other. The results were remarkable - achieving 77% overall agreement with the Wright Theory, and over 90% agreement in places. However, perhaps the most striking discovery from this project was the remarkable level of agreement among all observers - reaching over 92% in places - demonstrating that response to colour is not as dependent on age, gender or culture as was previously thought. For a copy of the full report, please telephone Colour Affects at +44 (0)20 7233 9904 or e-mail us.